In what turned out to be a bizarre clash of cultures, Chimamanda Ngozi Adichie was interviewed by Swedish film critic Jannike Åhlund at the Göteborg International Film Festival last Sunday. But the interview gets really awkward when Åhlund mentions that actress Thandie Newton, who plays the female lead in the film version of Half of a Yellow Sun, is “very white”. Adichie hits back with, “Maybe this is a good time to talk about ‘The Different Ranges of Colour in which Black People Come’ …” adding that it worries her that “to be authentically African, the darker the better”, and good-humouredly pointing out that her brother is lighter than Newton. 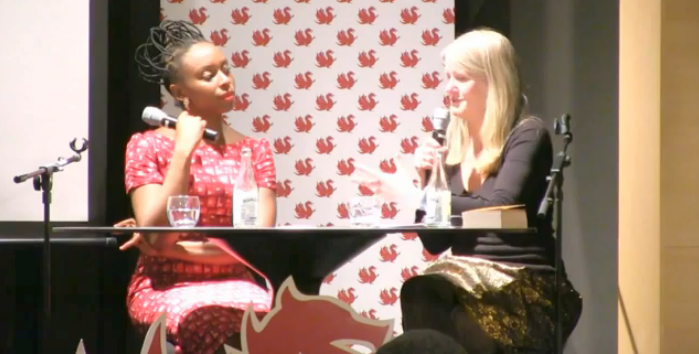 Åhlund goes on flippantly to label Nigerians’ reluctance to talk about the Biafran War as “ignorant”, but it is her indignation when Adichie raises Sweden’s colonial history that leads to the author’s most impressive “mini-lecture” of the evening (47 minutes in). Swedish South Africa-based film programmer, freelance-writer and author Katarina Hedrén, writing for Africa is a Country, admits to being shocked by the video’s content, but writes that overall she is pleased with the way it panned out. In the organisers’ defense, I would call what some considered a disastrous event successful, since it perfectly illustrated how the components in the event’s title ["Storytelling, colonial past and the present – a conversation with Chimamanda Ngozi Adichie"] play out in today’s Sweden – a country living under the illusion of a special kind of exceptionalism, which includes the assumption that it is “less affected by postcolonial relations than other nations” (the media studies scholar Ylva Habels’ definition).